Oh, Korea. You never cease to amaze me with your ability to come up with things that make me say "I didn't even know I needed that until I saw it." Korea specializes in having delivery service for anything and everything you can imagine. Grocery stores will deliver the food to your house if you buy more than a certain amount. Same with big stores like E-Mart. But the crowning jewel in all of this is the food delivery. Specifically, McDonalds. That's right, America. I hope you're listening. In Korea, McDonalds delivers. Want proof? Check out the website. I'd heard of this great miracle, but had never tested it for myself until tonight. Picture if you will: I've spent the day ordering new lenses for my glasses and passing a solid hour and a half in the hilariously named "What The Book?" english bookstore. It's been a big day. Now, I'm preparing for a wildly exciting Saturday night in Seoul, which this week consists of doing laundry and watching Doctor Who (season 4 Christmas special, for those of you keeping track. Oh, the feelings...). As is always the case, I don't want to eat any of the food in my house. As I watch David Tennant fight to save planet Earth from the evil timelords, my eyes wander to the little golden arch icon on my bookmarks bar (yes, I have it bookmarked. Don't look at me in that tone of voice.) Why not? I thought. McDonalds delivery (or McDelivery, as the website is called) is even better than normal Korean delivery because you can do it all on the internet! Normally, you have to use a good, old-fashioned phone call. Not a problem if you're fluent, but it's a lot harder to mime what you want over the phone. 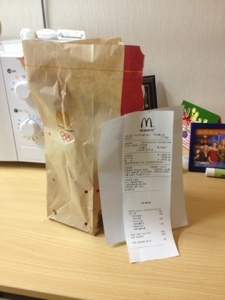 There's a 7,000won delivery minimum, which is easily met with a value meal and a Mcflurry. I placed my order, typed in my address, and boom! Half an hour later, right on the dot, this arrived at my door: One cheeseburger, fries, carton of milk, and a Mcflurry. Grand total? About $6.50. No delivery fee, no tip, no tax.